GearBox mount enclosures are designed to accompany Premier Mounts' flat screen mounts, projector mounts and peripheral equipment. Gear Boxes keep electronic components close at hand, offering electrical knockouts and integrated security for wall or ceiling installations. Display This Way offers compact equipment mounting boxes in many styles: in-wall mounting boxes for monitors, outdoor enclosures for monitors and TV screens, and pole mounts for ceiling projectors. See additional information on the Peerless FPE47FH-S Indoor Outdoor 46-47" Enclosure with Cooling Fans & Heat below. Certified mounting experts are here to help. Call 1-800-807-1477. See additional information on the Peerless FPE55F-S Indoor Outdoor 52-55" Enclosure with Cooling Fans below. Certified mounting experts are here to help. Call 1-800-807-1477. 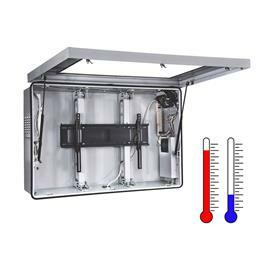 See additional information on the Peerless FPE55FH-S Indoor Outdoor 52-55" Enclosure with Cooling Fans & Heat below. Certified mounting experts are here to help. Call 1-800-807-1477.